2017 Real Florida Landscapes Design Competition Award Winners L-R: Chair Craig Huegel, Ivy Henderson accepting for Bryan Pepper, Andrea England and Matthew McFall. 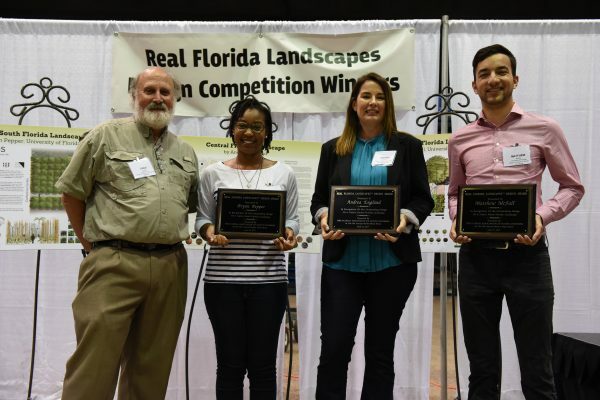 From 2013-2017, FANN sponsored the Real Florida Landscapes Design Competition. During that time, we received 59 submissions from both professionals and students. This page lists the winners for each year. FANN now sponsors the design competition portion of the Native Plant Horticulture Foundation’s Showcase Native Landscapes Program. Special thanks to Dr. Glenn Acomb, University of Florida, FASLA, for encouraging his Planting Design Studio students to participate in the competition. Go Gators!